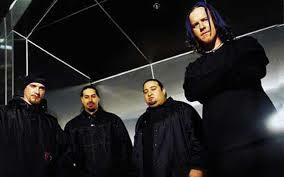 Demanufacture is the second full length album by the American industrial metal band Fear Factory. Released in June 1995 on Roadrunner Records, Demanufacture is a concept album with each track telling a different chapter in the life of a man struggling to survive in world of machine controlled governments. The lead singer, Burton C Bell, has cited The Terminator franchise as the inspiration for the concept but despite the tie to a huge commercial entity, this album expands on the idea in a much darker and colder manner then the movies ever gmanaged to. Before I talk about the music on this album, a quick nod of appreciation must be given for the album artwork which suits this album and this band perfectly. Seriously, look at that image above and then listen to the album. You will look back at that image and think, yep, that works perfectly. The opening, and title track, Demanufacture starts with the sounds of machinery before the drums join in and then the guitars building into one of the most recognisable riffs in heavy metal. The singing is aggressive, the guitars and drums sound heavy and mechanical and the song gives the correct impression of anger and hatred. Self Bias Resistor is the second track and jumps straight into a riff for all the headbangers out there and has a sing along chorus where Burton sings in his more melodic, tranquil style and all the while, the drums, guitars and bass chug along with their catchy riffs and mechanical sound. Zero signal comes next and starts with more mechanical effects before a slow chugging riff joins in. The start feels epic and, like most of this album, feels as cold and soulless as the concept of this album wants you to feel. 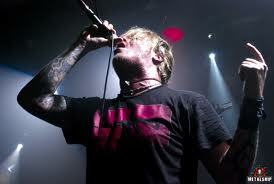 The pace of the song raises along with the start of the vocals which are as close to spoken word as they are shouted. The chorus is again sung in a more melodic style. The lyrical content is full of despair and the pattern of heavy and angry verses with empty, despair filled choruses continue until the song ends with a short organ section. Track 4, Replica, comes next and opens in emphatic style. The song has some of the angriest lyrics I had heard at the time and again follows the similar path of extreme agression in the verses building up and up until the chorus turns to a more sorrowful melodic style culminating in a fantastic song. New Breed follows Replica and is more pacier and thrashy then what has come before. It is the shortest track on the album, probably due to the lack of melodic choruses but is a welcome few minutes of mayhem. The next track is a cover of a track by a band called Head of David and is called Dog Day Sunrise. Despite being a cover, you wouldn’t know it as it fits in perfectly with the rest of the album. It is a slower track then the songs that have come before but that is a welcome change up. It is a decent but not brilliant song, that works well in regards to the concept. Track 7, Body Hammer, probably has a little feel of filler track to it but is still a decent track with a catchy riff running throughout. The chorus seems to be putting a little more strain on Burton’s voice than in some of the earlier tracks. Flashpoint, is another short track, coming in at under 3 mins long and is another awesome song. 30 seconds of slow build up lead into a furious and catchy riff that keeps on increasing in speed. This continues for half the song before we get the closest you will get to a short guitar solo and then the eeriest, melodic singing on the album. Before the track ends, it picks up pace one more time and ends with a frantic flurry. With only a few tracks left on the album, one of the best tracks on it comes on, H-K (Hunter-Killer), starts with eerie mechanical sounds and sound bites talking about guns and a crazy society before breaking into the rapid fire drums and riffs we have come to expect. The lyrics are aggressive over the drumming which is insanely fast. This track is gloomy, intense and brilliant. The second to last track is called Pisschrist and is again and aggressive fast paced track that perfectly captures the eerie intensity of the album and the concept. The melodic choruses return and fit in perfectly as well as an extended section to end the song which ends with the repeated line, “Where is your saviour now”. A truly gloomy masterpiece. The final track of the album, A Therapy for Pain, is recorded as being just under ten mins long but the last 5 minutes of that are closing effects. The song is nothing like what has been heard previously and is instead, slow and gloomy with a heavy use of keyboards to add to the effects. It has powerful moments and is quite enchanting and reminds me a little of Type O Negative. This album opened mine, and many others, eyes to the niche genre of industrial metal and there aren’t many better albums in that field than this. 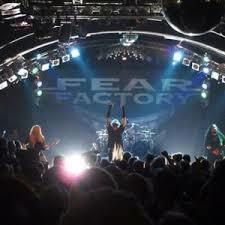 If there are, they are probably subsequent Fear Factory releases. This album is heavy, creative, aggressive and beautiful and is rightly regarded as a “Classic”. Fantastic album that still gets regular playtime now.